I really enjoyed reading this visually delightful hardcover 127 page book published by Lark Crafts. Maggie Meister has written an excellent book for the beader of intermediate skills. However, to widen its usefulness, she offers opening chapters on tools and stitches that are good for review, or as a reference for the learner. Meister draws from classical art for inspiration to create exquisite designs for her motifs and wonderful chains to enhance the motifs. I loved the spiral designs on the necklace in the second photograph. It is built up of small components that are then attached to each other. 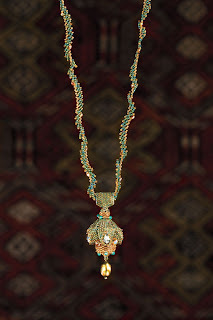 This last photograph has a delightfully complex and visually interesting three dimensional pendant and separate chain each of which would be lovely created and worn separately. The illustrations - both photographic and graphic - make the instructions easy to follow. 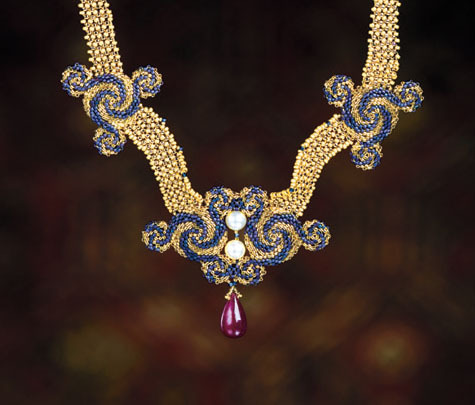 There are 20 unique designs and there are several options available to further enrich the offerings in the book. The designs are based on individual components that Meister then gives instructions for combining. By building on basic stitches, the projects build skills step by step. The author then gives suggestions for other ways the individual components can be combined to spur the reader into new interpretations. 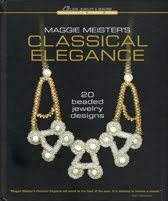 If you love a good visual treat on beading, I recommend this book. If you are an intermediate beader looking to increase your skills and design options, this is a great book. If you leave a comment by August 15 along with your name and email address, I will randomly draw a name and send the book to one reader.